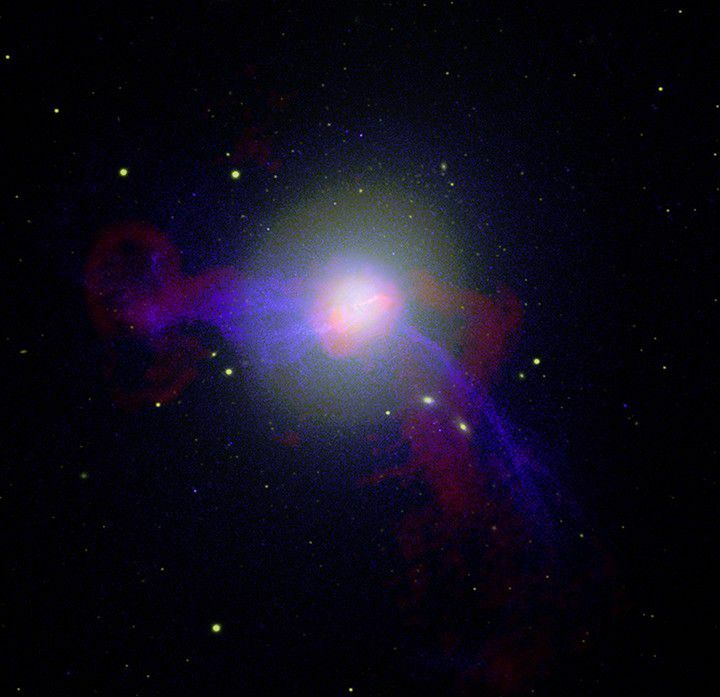 The M87 galaxy is part of a galaxy cluster 60 million light-years away in the constellation of Virgo, of which the other two most spectacular members are M84 and M86. Discovered in 1781 by Charles Messier, M87 is an elliptical galaxy with an apparent diameter of a quarter that of a full Moon. Its magnitude is 8.6 and it can be observed through a 100 millimetre diameter telescope as a small round cloud. This galaxy is well known for three reasons. First of all it has a jet of gaseous material escaping from its nucleus over a distance of at least 5000 light-years. Then, it is surrounded by several thousand globular clusters, whereas our galaxy has fewer than 200. And lastly it contains a powerful radio source (Virgo A) discovered in 1954, which is also an intense X-Ray source.